This is a thread I started on my personal favorite forums. Basically, I'm working on a fantasy / sci-fi project and I'm wanting the setting to be a planet in a binary star system. Cliche? Dunno. Anywho, mostly I'm trying to put at least a semblance of realism in how this planet will function. I want a large, blue sun (either a blue giant, or a smaller blue dwarf that is close to the planet? ), and then a small yellow sun. I want the planet to be in an orbit such that for part of the year, the yellow sun is hidden behind the blue sun. This is more for dramatic effect, but I want it to hold up to basic geek scrutiny if possible. What I originally wanted is for winter to be the period when the yellow sun is hidden, giving the planet an eerie blue light during the day, on and off greenish in the spring and fall, and normal(ish) in the summer. This evolved a bit as the discussion went on - if a blue giant, the planet would have to have a massive orbit, probably 3au out at least, or be a radioactive cinder. With such an orbit, perhaps the periods where the yellow sun is closer would be "summer", and then discussions of weird seasonal patterns and such. Then the suggestion to Universe Sandbox came and I tried - and failed, naturally - to create a stable binary system. If I can get a little help on how to set up a stable binary system with multiple planets in stable orbits, including one that could realistically support life, I'd buy this software in an instant just to have pictures and diagrams of how things work and have some great fodder for how things will look and feel. 1. Need to create a stable binary system with at least one life supporting planet; 1 small yellow sun, 1 large blue sun (or small blue sun closer to planet?) Planet will have 2 moons, and I want several other bodies in the system as well. ..A: How distant would the two stars need to be? ..B: How do I make the two stars orbit together, rather than one orbiting the other? Or would the smaller star orbit the larger like a planet? ..C: Should the planet orbit around both stars (the popular opinion in the above thread), or orbit the larger sun with the smaller in a more distant orbit? Any help would be appreciated, as there is no way I'm going to successfully set this system up on my own, knowing, well, next to nothing about the math involved in all this. Well, I can fudge on anything as I see fit, just wanting to fudge on as little as possible. Mostly I want to see how the orbit would work and use that as fodder for how the seasons go and how the suns would look in the sky at various points of the year. The Big Blue would have a habitable zone somewhere between Mars' and Jupiter's orbit distance. I'd guess a binary system would push that habitable zone out a bit. So I'm thinking (probably incorrectly) that I'll have the planet at about an 8 to 12 AU orbit from Big Blue, with the Small Yellow sun at around 3 to 4 AU from Big Blue. I'd like it to be that the planet has a more or less straight axis, and the seasons be more based on where the small sun is in relation. When the small sun is between the planet and Big Blue, it's summer, and when the small sun is "behind" big blue, winter. Well there is a thread "Calculation of the habitable zone around a star" that might help you with the calculation of the living zone (there is also a link to a wiki page about the argument). Pay attention: when the small sun is between the bigger sun and the planet is not the hottest phase: Some of the light from the bigger sun is hampered by the smaller one and doesn't get to the planet You should consider it as an autumn or a spring. True in theory, but what if the planet is relatively distant from the Big Blue (10 AU), but fairly close (2 AU) to the Yellow Sun at this time? I'll post an illustration later to see if it makes more sense. The illustration in the thread linked at the top is not going to work. Well, I'm thinking - and this is subject to change - that the planet would orbit both stars in a large orbit, with seasons being due to the Yellow Sun's orbit period, not the planet's own. This is what I originally had in mind, more or less. The Yellow Sun would only Eclipse the Blue Sun for a few days. The planet itself would have to have a very long orbital period, something on the order of Jupiter's orbit period. The Yellow Sun would have an orbital period similar to Mars - my original desire was to have a 472 day Calendar, and I'd like to try and get the solar system to function in such a way, more or less believably. I'm working backwards here, working from my original "universe building" work where I outlined what I wanted. At that point, everything was arbitrary, and it can change, just trying to work out the best way to do so. I know I want either a planet in a blue / yellow binary system, or possibly a very large moon around an equally massive gas giant planet, as what I want is for the winter time to have an eerie blue light to it, where the yellow sun is eclipsed by the blue sun / blue planet. But the planet needs to be larger than earth, for several reasons, so I'm not sure I want to go with a moon, as in addition I want the planet to have two moons. This is a fantasy story, and there will be some cosmology / astrology stuff based on the suns, moons, and other planets. If I have to just fudge it, fine, but I'd like to exhaust every possible way of making it stand up to geek scrutiny - hence why I was directed to this amazing program, and hence why I'm now trying to figure out how to set up a stable binary solar system. Well^^ that all sounds a bit creepy to me, because I am also writing a novel and I also have similar ideas. The habitable zone of a star is an obviously easy thing to calculate, if you have the right data about density, luminosity and so on of the star. 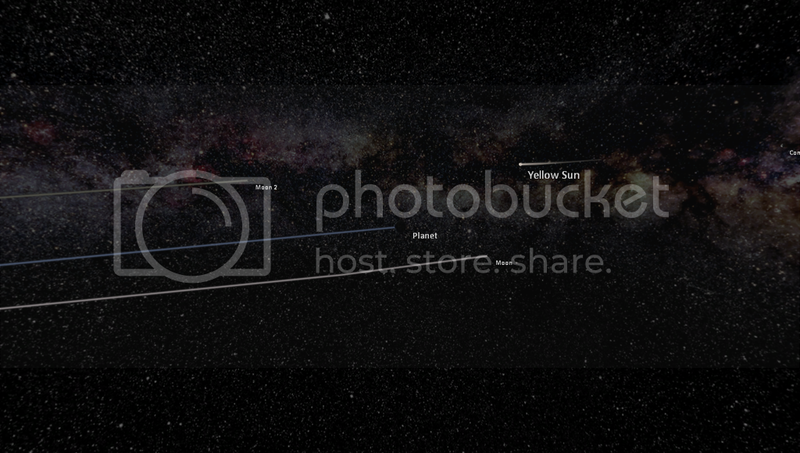 Your paintgraphic do show what you mean, but this habitable zone is still a 3 dimensional thing (a sphere). Also the orbits of the stars can can be in a right angle to the planets orbit. I hope you understand what I mean. If you are calculating the habitable zone of a binary star system you have to consider that in the overlapping parts of the two "habitable zones"^^ the mass of emitted get added up, and so its much hotter in these regions. In on thing you are right: when one star is covering parts of the other one, a bit of the rays emitted from the star behind get blocked. So its gets really complicated to calculate this. When you want to do this you have to find out how big the covered region of the bigger star really is, to calculate its apparently luminosity. So in the regions of space (maybe a specific view from a planet) where the smaller star is seen in front of the bigger blue one, the habitable zone gets changes. So you have to substract the rays that are coming from the covered region of the blue star and add the rays of the yellow star instead. I hope you got my point because this is really complicated. I also constructed a binary system for my novel and i have to say, this wasnt an easy task, even without such complicated facts like the different seasons and special solar eclipses. So finally I got it to work but its rather different from that one that you want to have. In my system there is a yellow star in the center then around it the planets (habited planet in a perihel of 1.25 AU) and in a really big distance a red dwarf with 0.084 solar masses and a diameter of 0.11 solar diameters. So the system is stable except the central sun has a wavy trail, caused by the gravity of the small star. If you are planning a blue gient for your system its maybe easier to get it stable, because of the big mass in the centre, wich is really enormous in relation to the yellow star. So Im really interested in those calculations and later this evening Ill maybe try to do a system which works for you. I f you want you also could take a look on my system, maybe to get some inspirations. I have a chapter and some random entries done, and a general outline. I want to have a lot of background info available so I can make a really unified cosmology / astrology based on the other bodies in the planet's system. The novel will tie in with some RPG campaign world stuff, ultimately. Hence why I was directed to U.S., and hence why I'm trying to get the system set up so as to be able to see how the planet's orbit will associate with it's seasons and such. I dont know on wich technological state your planet is, but when it is really really far developed it could have some devices that are regulating the weather and a climatic conditions of the planet and so compensate some problems caused by this srange starsystem. This would make things a bit easier (I did it this way). But when you are preferring a more medieval style of civilization, then this wont help. I'm writing fantasy, so I can magic away any real problems if I want, will of the God's and such. But I want to set up a more-or-less functional system for the purposes of me being able to watch the simulation and make notes in regards to seasons, eclipses, multiple solstices and equinox's, etc. I'm going to design the world's calendar, and some astrological / cosmological stuff based on a more or less realistic solar system. I don't need 100% realism - just enough that I can simulate it in this fine application so as to have some good fodder for calendar, astrology, etc. 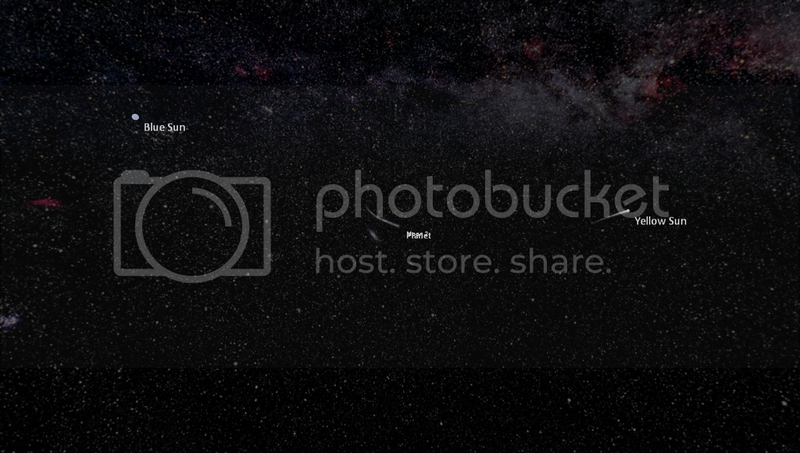 Updated title - at this point, I really need help creating a stable binary system I can play around in. I need a binary system with a blue giant as center, yellow star secondary. I need several planets in stable orbits, with at least one being earth-approximate, ideally about 1.2x earth diameter. That planet needs to have 2 moons, one either larger, or closer, than the other (so as one appears much larger in the night sky.) The earth-like planet needs to be on an orbital plane such that both suns can eclipse each other. Comets in said system would rock too. I either need help with how to start / build such a system, or if someone has time, the .xml to load it up. I'll happily buy this program if that occurs - this program rocks, but I'll never have the mathematical know-how to create the system I want on my own, methinks. You would need the planet FAR out. And the satars FAR out. Most planets orbit one star and the other goes around both. e.g. giving some days NO night. 360 degree illumination. Only one planet has been discovered AROUND both stars. 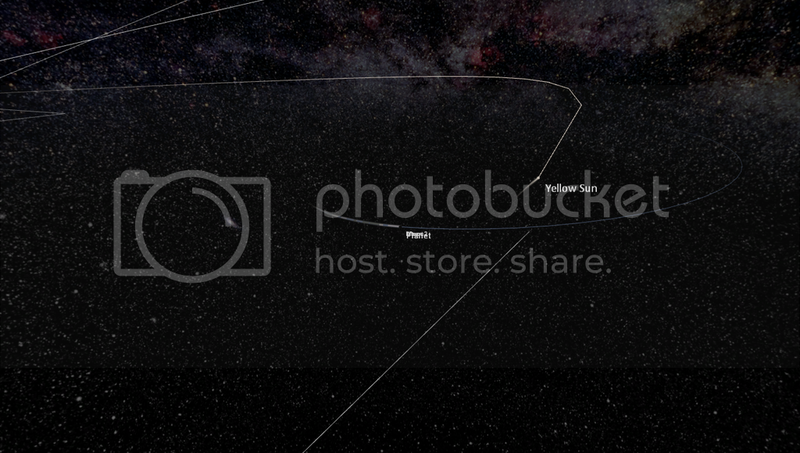 That's really cool that you're wanting to use Universe Sandbox as a way of visualizing a solar system for your story. What you're wanting to do is certainly possible, it's just that Universe Sandbox doesn't yet have really good tools to create a solar system from scratch. If you drop in a star and then drop in a smaller star you can choose 'Orbit All' to get a binary system. Then choose 'Balance System Momentum' to keep it from drifting off the screen. 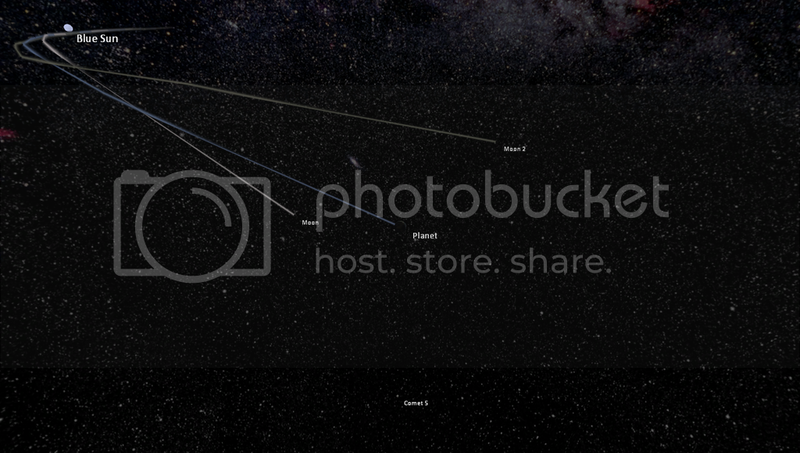 Now you can add other planets, right click on them, and select Orbit parent. Unfortunate there's currently no way to get the planet to orbit the center of mass of both stars, but the results may be quite satisfactory. Do the same thing to add a moon to the planet. (Add a moon, right click and click 'Orbit Parent'). - You can turn on projected paths (Proj. Paths) to see where stuff is headed (although based on the mass of the largest body and not both stars). - Turn on relation lines (Relations) to see the parent-child relationships. If you still need help, let me know and I'll put together a download system for you. Thank you! I'll be messing with it a bit over the weekend and if I still can't set up an appropriate system I may just take you up on that. Thanks for making such a neat tool, I remember a few years ago when this idea first popped into my head thinking it would be nice to have a solar system simulator to plan out the calendar and such... and here it is. Yes. Please let me know if you need help. I'll have to think about a 'better' way of creating binary systems as the current 'Orbit All' and 'Orbit Parent' commands aren't really designed for this. Well I tried my best. So it's year is a little longer than an Earth year. Not sure how long it takes for Yellow Star to orbit t he Blue one. I did a simulation as suggested by the FunkThompson: a system with a star with mass of the Sun orbiting a blue giant with mass of Rigel, around the them a planet with a mass twice that of Earth. Calculated that the habitable zone around a star like Rigel (about 60000x bolometric luminosity of the Sun) is about 244 AU from the blue giant star (the brightness of the yellow star was negligible comparatively the radiation of the giant blue star.) . The simulation of the planet reaches its aphelion to 222 AU and the perihelion to 160 AU, it is outside the habitable zone, but the difference in distance has little effect on the standard study of the orbit. As can be seen in the simulation its orbit is very interesting, doing small senoidals courses especially at aphelion (the orbital speed in perihelion prevents the effect). What are the effects on climate on this planet due to the wave characteristic of the orbit ? This is a really interesting question and could generate elements for a good fiction. Attached is the XML file of the simulation. The period of the Yellow Sun are 21.692 years. The Sun cover the blue star two times each year by the point of the view of the planet. Thanks, your systems are very good too ! Yours makes a lot more sense than mine. xD But I guess mine is possible is it not? Also while playing around with my binary system.... Comets would get trapped by the yellow sun Gravity causing it to become a comet for the Yellow sun and not the Blue Sun. Very interesting the effects Multiple stars have on other objects. Well, let´s go simulate to discover the answer ! Here is some links to binarys, triplets, etc.